CONNECT BEYOND REAL ESTATE to Attract Future Clients 5 Reasons Why YOU NEED A MENTOR Are You Doing Business As You on FACEBOOK? 4) CONNECT BEYOND REAL ESTATE TO ATTRACT FUTURE CLIENTS 13) 5 REASONS WHY YOU NEED A MENTOR 17) ARE YOU DOING BUSINESS AS YOU ON FACEBOOK? VICTORIA PRINTZ If anyone knows real estate in Midland, Texas, it’s Victoria Printz. “I knew I would get into real estate at some point, but I wanted to do other things first,” says Victoria, who grew up in Midland, “being late for cheerleading practice because there was always one more house for my mom to show.” After all those years being shuttled from property to property, at age 18 she left Midland thinking she’d never return. But home called her back. department. 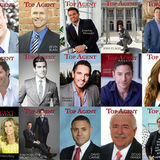 “Out of approximately 511 agents currently in Midland, to my knowledge only a handful have someone doing their marketing, but we have a team of three – a media marketing director, a marketing director who manages all the photos from the houses, and a special events marketing coordinator,” says Victoria. Her sellers, therefore, benefit from wide but targeted exposure across various outlets. agents still represented both buyers and sellers in a given transaction. But Victoria sought clearer lines. “I knew I might spend an hour in the house and be able to bring them an offer the next day representing a buyer, but I didn’t ever want the confusion over who was representing whom.” This ideology led to starting her own firm, where she focuses on listings and her agents primarily represent buyers. Looking ahead, Victoria plans to expand her strong presence with the relocation market. “So many large oil companies are located in Midland and we work hard on behalf of the international relocation companies,” she says. Local market expertise, savvy negotiation skills, plus a love of working with people – not to mention ballroom dancing – helps Victoria make Midland real estate appear to be a smooth waltz. 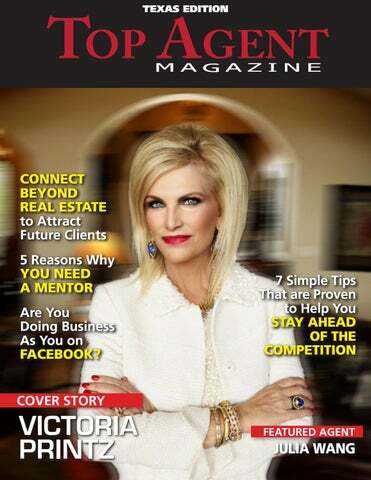 To learn more about Victoria Printz, visit victoriaprintz.com, email victoria@victoriaprintz.com or call 432.683.1000 www. JULIA WANG Not only does Julia build strong relationships with her clients, she maintains them long after the active transaction. She holds creative client appreciation events throughout the year and stays in their lives via social media, where she has an active presence. Julia quickly become a rising star in the industry, and was recognized by the Houston Association of Realtors® as one of the ‘20 Under 40’ Rising Stars in Real Estate for 2017. She is a top-producing Realtor® at Nan & Company Properties. Julia serves all of the Greater Houston area, and has recently begun specializing in luxury properties. Key to her her rapid success is her hands on approach to sales, and her determination to provides a level of customer service that is truly unparalleled. Julia is active in her community, in particular with the schools that her two young children attend. Through her brokerage, she participates in several charitable events throughout the year, including an annual toy drive for underprivileged children. When she isnt working, Julia and her family love to travel and see the world. To learn more about Julia Wang, call 713.714.6454, email julia@nanproperties.com or visit nanproperties.com/agents/julia-wang www.